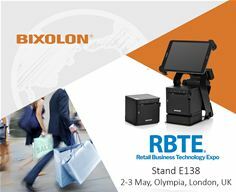 Retail Business Technology Expo 2018 (2nd – 3rd May 2018, London, UK)– BIXOLON Co., Ltd a global leading Mobile, Label and POS printer manufacturer will be encouraging visitors to the BIXOLON stand E138 at RBTE 2018. Showcasing a range of innovative POS, label and mobile printing solutions that can easily be upgraded at your system evolves. From complex omni-channel retail systems to simple pop-up setups, BIXOLON’s experience within the retail environment means that they can provide tailored printing solutions for independent traders through to major retailers. SRP-Q300 Series – BIXOLON’s first 3-inch (80mm) Direct Thermal compact Receipt and Ticket printer, with flexible mPOS configuration capabilities. Including the SRP-Q300H featuring an intelligent hub (B-gate), connecting up to 4 USB peripheral devices (scanner, cash drawer, customer display, RFID reader, scales, etc.) to the host tablet (via Bluetooth) and providing a single charging port. Printing receipts or online orders through a native, web and cloud-based mPOS application with B-gate SDK’s (Software Development Kits). BIXOLON will be pairing the printer with its new LCD customer Display (BCD-3000) and a robust steel tablet stand which safely secures up to a 10inch tablet using a locking mechanism and 170° forward-tilting feature to provide a complete hospitality mPOS solution. SLP-TX400R – 4-inch desktop label printer with RFID technology, supporting both direct thermal and thermal transfer printing at speeds up to 7 IPS. Supporting USB, Ethernet, and Serial, with optional Bluetooth or WLAN interface. Alongside an optional auto-cutter and external label holder for higher-volume label rolls. Ideal for simultaneously printing and embedding UHF RFID codes into inventory labelling, price tags and more. SPP-L3000 – showcasing its extensive range of 2”, 3” and 4” mobile printing solutions including the NEW SPP-L3000 launching later this year. A compact, lightweight 3-inch industrial mobile printer, fully compatible with market-leading languages and is ideal for supply chain labelling, retail tags, delivery invoicing and more.